Developed by Big Ape Productions in 1997, Herc's Adventures does for Greek Mythology what Zombies Ate My Neighbors did for Horror Movies. You choose one of three mythological heroes, Jason, Atalanta, and (as the title suggests) Hercules and pilot them through top down levels infested with all manner of source material appropriate enemies and a few straight out of left field (ancient Greece had a clown problem apparently) to eventually get a shot a taking down Hades himself. To aid you in the effort, you have a wide variety of weapons ranging from the expected swords and spears to things like ray guns and cows. Needless to say, this game doesn't take itself too seriously, but that's half the fun. Best European version time: Single-segment 1:19:01 by Benjamin 'Chfou' Desmoudt on 2013-07-30. I would to thank first HonorableJay and DumpsterKnight for showing me their support when i started running the game. Thanks to Nate who helped me passing the quality test. Also thanks to the whole SDA community. Seeing all your runs inspired me to run one of the games I liked the most when I was younger. 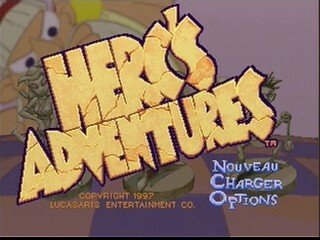 Herc's Adventures is an action-adventure game released by Lucasarts in 1997 on PlayStation and Sega Saturn. His gameplay is similar to Zombies Ate my Neighbors also created by LucasArts and released in 1993. This run is a Single Segmented run with Athena. The version used is the PAL french version. I play the game on my PS2, but playing it on a PS1 or PS2 doesn't matter because there is absolutely no loading screen once the timer starts. The Spear-run trick : If you constantly throw spears while running you will still run but you will recover your stamina at a normal rate. The recovering lasts until you run out of spears. This is useful for the beginning of the game because you need to manage you stamina. Bomb weakness : Skeletons and Soldiers take usually twice the damage of the bomb, resulting of an insta-kill except for Soldiers in Clochis). This make bombs one of the most OP weapons in this game and thus, it's a must have. Reloading zone trick : Even if the the game doesn't have loading screen, a drum melody is played letting you know that you enter in another area. If you go back to the area you just leave, almost every object will respawn except for the ones that are collectible only once. Speech skip : There are some area where there is a trigger which make the Character talk. The triggers locations are different for each Character. Jumping over these triggers doesn't activate the speech. this save a few seconds for each speech. Fast boat : Hitting the drum with the right timing speeds up the boats. I chose Atlanta because she is the fastest of the three character by a lot. Even if she lose a lot of stamina while lifting and start with the lowest stamina (40 SP), her charged attack is the best (6 arrows, each arrow deals 8 damage). Also her stamina loss when running is so low she can run more than twice longer than the other heroes. I used every gold/drachmas I grabbed, and entered the Giant Snake zone with no gold at all. After this zone, every gold collected was on the road. Almost every gyros collected were used, the remaining gyros were for the Cerberus and hades fight in case of thing would have turned bad. Mud : Mud slows you down. Jumping will always make you move at normal walking speed no matter where you walk on. Running on mud is slightly faster than constantly jumping. My choice is to jump constantly if my stamina is low (~50 SP). I prefer regaining some SP by moving slightly slower and run longer once i'm back to the road. Every weapon and item can be used while running and don't slow you down. Note : I pause the game two or three times to check if i have enough Keys or Gold. Each pause last less than one second. I run through every zone pretty smoothly. I used the Spear-run due to the low SP of Atlanta in order to keep a decent speed throughout the zone. I threw a bomb at 1:56 because there is a chance a Skeleton spawn in front of me, blocking me the way. Skeletons usually spawn in number and Atlanta lack of multi target. Using bombs definitely saves a lot of time. This boss is simple, its spawn location depends on where you arrive when you fall in the pit. By falling where I do, it spawns near me and uses its laser. I manipulated his AI it run back and forth near the Heart bonus and the exit of the maze. I spend all the gold I grabbed plus the three drachmas near the muscle man. All this gold is spent to increas my stamina to 260, letting me run through Sparta using only 1 or 2 gyros. I messed up the Spartan fight costing me a few seconds and an extra gyro. I used the two drachmas I collected to increased my stamina to 310 and leave Elis with max Stamina. It was a nice run. At 13:29, i check the number of soldier once I land. If less than 4 Soldiers spawn, then no Soldier will spawn on the platform at 13:36. I 4 Soldiers spawn, a Solider would have been here a i should have throw a bomb before juming on the platform. I went too fast and the Minoan who trigger the gold pedestal reward spawned with a delay. I have to talk to Poseidon in order to get to Crete, otherwise the tuna will not spawn. I open a door because it will be faster to run through the city when I return there later. The minotaur only takes one damage from anyhting, even thunderbolts who deals normally 28 damage. The Fire breath comes in handy because it always deal 1 damage and can do more than 1 damage with one ammo. Only lifting and throwing his axe in the facedeals 28 damage. After he lose half his health, you usually chases you and try to hit you in melee range before throing his axe again. I managed to make him only throw his axe. It was a really, really good fight. No problem except for the Soldier who didn't get hit by the bomb. Bob is a nice guy a gave me Thunderblots. The boss can only take 30 damage for each phases. I one-cycled phases using my item as well as the statues in the room(thanks Atlas, Bob, Ralph and ED for supporting me during this fight). During his two super-speed phases he ran the way i didn't expected. At 21:54, there is no way I could have dodged this tornado, costing me a few seconds. I need at least 6 gyros because one of the door is opened after giving two gyros and getting Evil Taboos cost 4 gyros. Evil Taboos make the last way easier and faster. After taking the lipstick, i grab the Password, Thunderbolt and Drachmas and use the reloading zone trick to grab anoter normal and 'H' key I use later. I use the reloading zone trick here to grab an extra Baby so i can directly have a Password. Back again in the labyrinth to get Fire Breath. I use the Password to open the way and i buy 160 Sticks. I've already tried to buy less but it makes the Snake fight a lot more harder and slower. I hit the vendor 3 times to shorten the time i have to wait between two buys. I failed it only once. WARNING : Turn the volume down before playing this part! Hewk are great drawing attention of Medusa. I still got hit but less than if I don't use Hawks. I switch from Fire breath to Bomb otherwise the Fire breath would have hit the Witch instead. You can also see the splendid waste of two Thunderbolts (not a big deal tho). After the fight i use all the Fire breath left because i don't need it nymore and it helps goings through the weapons. Nice zone, nothing much to say. I missed the trigger because i jumped too late. I hate ice levels. Meh. I just skip that fight. 52:07 : First time I got stuck like that. 53:05 : The mathematician didn't talk once he spawned, I saved a couple of time here. The run went pretty good otherwise. I've never messed up this fight and I didn't messed up this time. Bald Harpies don't really like Raygun. Good thing i have some ammo to use. The Soldiers there have 30 hp, so the Evil Taboo is the best weapon against them. Door code is fixed and is 2-3-2-1. Fastest way to progress through that bone mess? Just bomb the place, a lot of times. Normally snowballs deals only 2 damage and frezzes normal enemies. Against Cerberus, well.... you see by yourself. Door code is 2-3-2 for every PT. I use the last god keys I have for more fire power. The only technique for him his stay in the middle of the room so his hands can't grab you. Also you have to shoot him until he dies so just use the most powerful weapons. I almost ran out of Raygun ammo for his last cycle. If I had bought less Fire Sticks, this could have been really bad. Well, this is not a part of the run since you can't win or lose, but I recorded this level to show one thing that made me smile the first time I've won the game. I find this way to show the credits well done. Also the credit music worth to be heard after a run.